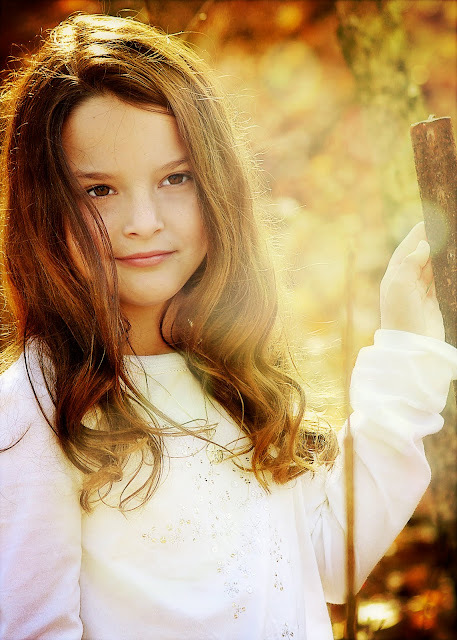 I've got a little mini-tutorial for you today on my Brown Haired Girl. In an effort to be creative and witty I tried to think of a title other than "Tutorial". Obviously that plan didn't work out too well and "Anatomy" is the best I could come up with ~ enjoy! I say 'mini' due to the fact that I'm not giving screen shots or exact instructions on every single step. I've said it before and I'll say it again...I'm a hacker when it comes to editing...a little of this...a little of that...maybe see what happens when I click this...you get my point? Which means my Anatomy Lessons will primarily be about how I've used textures or actions to enhance a photo. I'm a texture junkie and can't live without Rita's actions so you'll be seeing LOTS of those here! Obviously she is perfect without any assistance from me but if I stopped now this would be a boring post! 1. 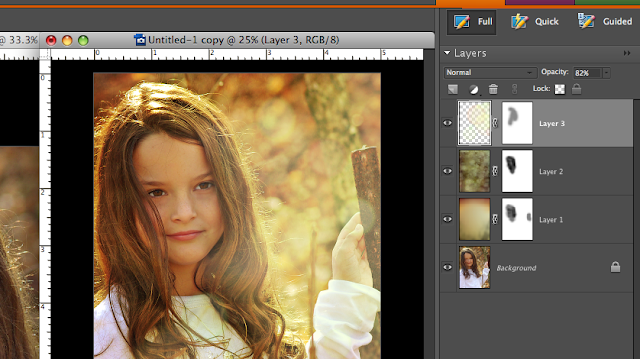 I opened my original pic in photoshop elements 6 (mac version...there's nothing better!) and cropped in a little closer. 3. After touching up the face I ran Erin's Defog action to give an overall boost to the pic. This action is great for lifting that "haze" that is so often on photos that you may not even recognize until after you've defogged! 4. Then I started adding my textures...here comes the fun! All textures are from the Kaleidoscope collections. A. Select your Lasso Tool in your toolbar. Make sure your texture layer is highlighted. Here's a screenshot for you of what it looked like when I lassoed her face to take off the texture. Now that I have all my textures on the photo here's a screenshot of my layers palette showing each texture and it's layer mask showing how I just erased some of the texture off the face. 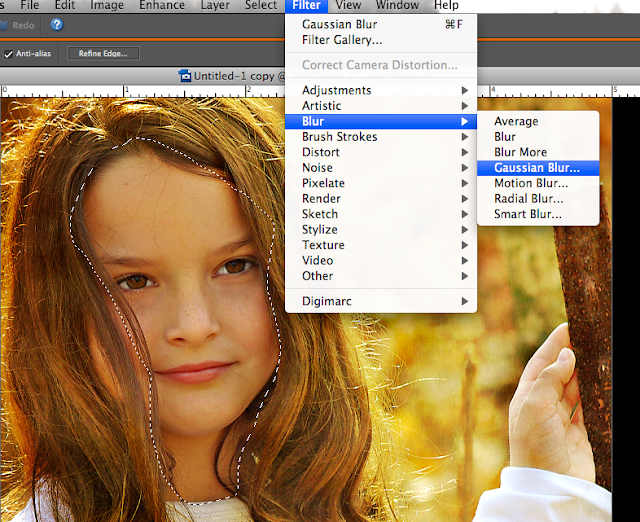 A layer mask just attaches itself to the 'layer' and allows you to make adjustments to that layer specifically. You can grab a free Layer Mask Action here along with great instructions on how to use it. Those black/gray places on the white masks show where I chose my Brush - set foreground color to Black - then brushed on the area where I wanted to 'erase' part of that texture. 5. Now it's time for some action! I wanted a dreamy effect on this so I ran the Orton action then flattened my layers. and chose the Urban selection. Love Love the Urban look! 7. I lowered the opacity of the Urban layer to 85% and also darkened just a little around the edges then flattened my image and called it a day! ...and here's the finished product. Not necessarily better, just enhanced! I hope this helps to encourage you to give those textures and actions a try! I usually just layer them up and see what happens...there's no right or wrong...gotta love that! Absolutely beautiful! So creative you are! Hi, beautiful photo. one day i will find some more computer time and try this myself! maybe after christmas...hopefully! can i ask a question? i notice you have a gmail blog. so do i. i can't seem to get my photos to be any larger. i would like them to be as big as yours, any suggestions? or am i just being a dork? Definitely not a dork ~ photos look better BIG!! My template is a photo template that I downloaded from Our Blogger Templates. It's made specifically for larger photos..which is why all my "stuff" is at the bottom of the blog. Check out their site, they have lots of free photo templates to choose from. And be sure to let me know if you go with one! great! thanks for the info on changing my picture sizes! i will check it out. can't wait to see your next photo! I just got a new camera and photoshop elements 8 for my birthday in October. I am so glad I found your blog and the tutorials. I definitely will have to try this since I haven't a clue what I am doing.